Delshad, Soheil, and Mojtaba Doroodi. 2019. DNf: A new inscription emerges from the shadow. Arta 2019.001. DNf is a recently-discovered trilingual inscription on the tomb of Darius I at Naqsh-e Rostam. This article presents images, a first edition of the texts, observations on why the inscription was not recognized earlier, and comments on the relationship between the inscription and the sculptured figures below it. Albino, Marcos. 2017 . Zur Erfindung der altpersischen Schrift. MSS: Munich Studies on Linguistics Issue 71(2): 181-200. In diesem Aufsatz stelle ich die Hypothese zur Diskussion, dass die altpersische Schrift unter Darius I. erfunden wurde, und zwar auf folgende Weise: ein Gelehrter („der Erfinder“) schrieb erst in aramäischer Schrift den Name des Darius, seines Vaters, seiner Vorfahren und die der anderen persischen Könige. Dann erfand er willkürlich das Zeichen für den ersten Buchstaben in Darius’ Namen und modifizierte dieses Zeichen für die anderen Buchstaben dieses und der anderen Namen: (fast) jedes neue Zeichen ist das Ergebnis der Modifizierung des Vorangehenden oder eines in seiner Nähe in der aramäischen Vorlage. Davari, Shadi & Mehrdad Naghzguy-Kohan. 2017. The grammaticalization of progressive aspect in Persian. In Kees Hengeveld, Heiko Narrog & Hella Olbertz (eds. 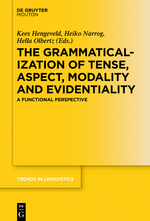 ), The Grammaticalization of Tense, Aspect, Modality and Evidentiality: A Functional Perspective (Trends in Linguistics Studies and Monographs 311), 163–190. Berlin: De Gruyter. This paper investigates the development of the Persian lexical verb dâštan ‘have’, which has grammaticalized into an auxiliary verb functioning primarily as a progressive aspect marker in durative situations, and which is currently developing into a prospective marker with achievement verbs. Possessive progressives are a cross-linguistic rarity and deserve attention. We suggest that the progressive function arose through context-induced reinterpretation based on metonymic relations. The resulting reinterpretation of dâštan ‘have’ to ‘ongoingness of a durative event’ represents a conceptual shift, in the form of metaphoric extension, from possessing a physical object to possessing the continuum of an action in a focal point of utterance. We will also illustrate that the progressive’s focus on subjective notions leads to its development as an expression of the speaker’s attitude that does not describe properties of a situation in the extralinguistic world but rather in the subjective conceptualization of the speaker. The auxiliation process of dâštan ‘have’ in Persian will be analyzed based on the Auxiliation Dimensions Model proposed by Davari and Naghzguy-Kohan (forthcoming), which focuses on the force, the source and the degree of auxiliation. We also point out that these changes are in tune with the overall directionality of semantic change in grammaticalization according to Narrog (2012), namely, increase in speaker-orientation. Rezania, Kianoosh. 2017. Raumkonzeptionen im früheren Zoroastrismus. Kosmische, kultische und soziale Räume (Iranica, GOF III/NF 14). Wiesbaden: Harrassowitz Verlag. Space, like time, is one of the basic categories of our thinking. Their concepts do not remain constant in different cultures or in changing periods, which is why dealing with a historical cultural phenomenon always requires a review of these categories in their specific culture and time. Based on the oldest linguistic and architectural evidence of Iran from the 12th to the 4th century BC, for the first time Kianoosh Rezania offers a comprehensive study of space concepts in Zoroastrianism in ancient Iran. Based on current and historical theories of space, the Zoroastrian spaces are divided into cosmic, cultic and social spaces. The depiction of the cosmic spaces describes spatial abstractions in ancient Iranian languages as well as Zoroastrian boundary principles. Rezania examines the coordinate systems that ancient Iranians used for orientation in space and how they transformed their cognitive maps into text. This also includes the portrayal of the Zoroastrian worldview according to their older texts. At the intersection of cosmic and cultural spaces, there are transcendent spaces that contain, on the one hand, utopian spaces for communication with gods, some of which are written by poets. Since the study does not rule out dynamics and change processes in the ritual domain, reconstructions of Zoroastrian ritual surfaces in the Avestan period are presented without the inclusion of recent materials. In addition, the spatially represented social structure of the Avestan society and their spatial symbolic orders are presented. For the table of contents of this volume visit here. Delshad, Soheil. 2017. Report on inscribed fragments excavated from drainage system of Southern courtyard of Tačar. In Asadi, A. and M. Mansouri (eds. ), Excavation reports of the third season of archaeological excavations at Persepolis drainage system, 121–135. Persepolis World Heritage Site. During the second and third seasons of excavations at Persepolis drainage system (led by A. Asadi and M. Mansouri), three inscribed fragments have been excavated. The exact findspot of those fragments is the water channel at the southern courtyard of Tačara Palace. The first two fragments have been found during the third season of excavations (i.e., 1396: 2017) and the third fragment has been revealed to the excavators in the second season (i.e., 1393: 2014). دلشاد، سهیل. 1396. گزارش خرده‌کتیبه های شناسایی شده از آب راه حیاط جنوبی تچر. گزارش فصل سوم کاووشهای باستانشناختی آبراهه‌های تخت جمشید (ا. اسدی-م. منصوری)، پایگاه میراث جهانی تخت جمشید، صفحات 121-135. For more information, click on the photo above or follow this link. Schmitt, Rüdiger. 2016. Stilistik der altpersischen Inschriften. Versuch einer Annäherung. (Veröffentlichungen Zur Iranistik 79). Wien: Verlag der Österreichischen Akademie der Wissenschaften (ÖAW). The present study makes the first attempt to compile in a systematic manner the figures of speech and other stylistic phenomena attested in the corpus of the Old Persian royal inscriptions. For those texts are different from simple prose in that they show clear traces of a stylization that similarly to using certain words and word forms lend them characteristic features of an artificial language. The phenomena to be treated in that context are presented in transcription according to the author’s text edition (Die altpersischen Inschriften der Achaimeniden, 2009) in form of a list without classifying them according to criteria of sound or those of grammar, lexicon, and syntax. References to comparable phenomena in the related languages (not least also in Avestan) are given only quite rarely in order not to distract the reader’s attention from the Old Persian data. The comparison with Avestan or within the ancient Indo-Iranian languages, i. e. in form of “Comparative Stylistics of Indo-Iranian”, has to be planned only after having finished collecting the evidence of the individual languages in full. Suggesting such a study is one of the intentions of the present book. Rüdiger Schmitt, from 1979 to his retirement in 2004 Professor of Comparative Indo-European Philology and Indo-Iranian Studies at Saarland University in Saarbrücken; born in Würzburg on June 1, 1939; studies from 1958 to 1965 in Würzburg, Erlangen and Saarbrücken, particularly with Manfred Mayrhofer; after publications on Indo-European poetical language, on the Greek and Armenian languages specialized on the ancient Iranian languages, Old Persian epigraphy and, above all, Iranian personal names. Krasnowolska, Anna & Renata Rusek-Kowalska (eds.). 2015. Studies on the Iranian World I. Before Islam. Krakow: Jagiellonian University Press. This volume is the proceedings of the Seventh Conference of Iranian Studies of the Societas Iranologica Europaea (ECIS7), organized by Societas Iranologica Europaea (SIE), which took place in Cracow, September 7-10, 2011. The first of the two volumes of the ECIS7 proceedings is dedicated to the pre-Islamic Iranian studies. Anna Krasnowolska is a professor at the Institute of Oriental Studies, Jagiellonian University. Renata Rusek-Kowalska is an assistant professor at the Institute of Oriental Studies, Jagiellonian University. Jügel, Thomas. 2015. Die Entwicklung der Ergativkonstruktion im Alt- und Mitteliranischen. 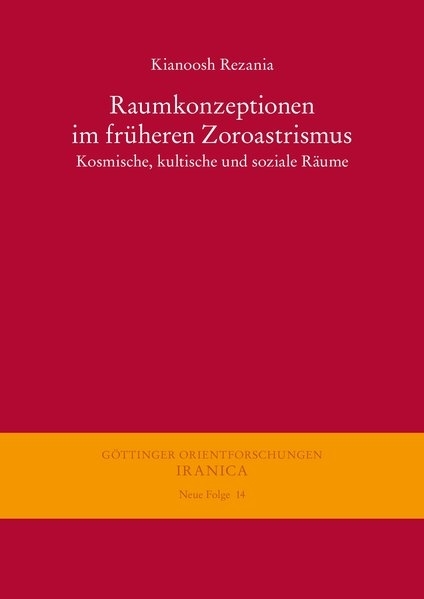 Eine korpusbasierte Untersuchung zu Kasus, Kongruenz und Satzbau (Iranica 21). Wiesbaden: Harrassowitz Verlag. Ergativity is a grammatical phenomenon that has been discussed controversially in linguistics in general and in the Iranian Studies in particular. The scientific debate is characterized by a lack of consideration of the Old and Middle Iranian data. In many cases, the selected examples, which their position in the respective language system is still unclear, are associated with theory-driven assumptions about a hypothetical model of development, which is to be plausible, but not verifiable. The present study provides a solution through the complete analyzing of the Avestan , Old Persian, Bactrian and Parthian documents as well as an extensive study of Middle Persian evidences (approximately 12,500 Middle Persian cases). In addition to the relevant ergativity aspects such case, congruence, word order, and reflexivity both the development of syntactic structures (e.g. relative clauses) as well as the verbal and nominal system (e.g. the temporal aspect system or the function of enclitic personal pronouns) are discussed . Results are illustrated with relevant evidences (over 1,400 examples alone in the main part), whose validity is constantly checked and based critically on detailed philological discussion. The material part also serves as a vademecum, which can be used in parallel with the reading of the main part, as well as a separate reference book that systematically illustrates the history of the object in ergative languages. The volume presents the most exhaustive investigation on ergativity in within the Old and Middle Iranian languages.